Historic Hampton Court Palace lies southwest of London on the north bank of the River Thames. Built in 1514 as a private residence for Cardinal Wolsey, the palace was later presented to Henry VIII to secure the King's favor. Five of Henry's six wives lived here as queen, and the ghosts of the third and fifth - Jane Seymour and Catherine Howard - are said to still haunt the palace. It was also a favorite residence of Elizabeth I and was where she was staying when news broke of the defeat of the Spanish Armada. Charles I also lived here, both as King and as Oliver Cromwell's prisoner. The palace was opened to the public during Queen Victoria's reign and although no longer a royal residence, parts of it are occupied by individuals granted "grace and favor" apartments by the monarch. Hampton Court Palace is a wonderful place to spend a day and offers numerous fun things to do, including royal feasts, a festival, flower shows, fishing, overnight stays, and bicycle tours. The State Apartments are a highlight of any visit to Hampton Court. A good place to begin your visit is in the Buttery, with its excellent film depicting the lives (and deaths) of Henry VIII's wives. The surviving sections of his quarters consist of the magnificently decorated Great Hall and the Great Watching Chamber, as well as the King's Council Chamber and the Processional Route linking the rooms. The Great Hall in particular is a worthy place to linger - not only is it England's greatest medieval hall, it became one of the country's most famous theaters, even hosting Shakespeare's company in 1603. The apartments of King William III were designed by Christopher Wren and decorated throughout by beautiful and delicate wood carvings of the 17th-century master craftsman Grinling Gibbons. In the State Apartments, the opulent Great Bedchamber wasn't where the king actually slept, but was where he dressed in the presence of his courtiers. Downstairs in Williams III's Private Apartments, rooms are more livable and display his personal collections of favorite art. The apartments of Mary II have been restored as they would have appeared to George II's wife, Queen Caroline, between 1716 and 1737. In continuous use for more than 450 years, Hampton Court's royal chapel has a breathtaking timber and plaster ceiling - perhaps the finest example of Tudor interior decoration in the palace - and historic Royal Pews, where Henry VIII sat as he read the accusations of his young wife Catherine Howard's supposed indiscretions before their marriage. A replica of King Henry's Crown of State, the original of which was melted down by Cromwell, sits in the Royal Pew. Visitors can also attend Sunday services here: Holy Communion at 8:30am, Choral Matins at 11am, and Choral Evensong at 3:30pm. The vast medieval kitchens and cellars at Hampton Court provide a fascinating insight into the logistics of having to feed the palace's 600 members of the court, who dined here twice daily. Built in 1530, the kitchens were a central part of palace life and employed numerous Master Cooks and their staff. You can also visit the recently discovered 18th-century Chocolate Kitchen with its original braziers and equipment. Fun dining events are also regularly held, allowing guests a chance to try the traditional dishes prepared in the kitchens. The Clock Court, in the center of Hampton Court, is home to the spectacular astronomical clock made for Henry VIII in 1540. It's connected to a set of three bells situated in the Belfry, the oldest dating to 1478 and presented to Cardinal Wolsey by the Knights of St. John. Made by French clockmaker Nicholas Oursian, this fascinating timepiece is 15 feet across and consists of three copper dials indicating the hour, month, and day; the signs of the zodiac; and even the position of the sun. Allow plenty of time to explore the palace's 60-acre grounds - the Privy Garden, the Pond Garden, the Elizabethan Knot Garden, the Broad Walk, and the Wilderness - particularly in mid-May when in full bloom. Also of interest is the Great Vine, the largest grape vine in the world at more than 200 years old. It's 81 inches thick and still produces fruit. The Lower Orangery contains Mantegna's masterpiece, The Triumph of Caesar. Entering Hampton Court's huge maze will probably be the one time you won't mind getting lost in England. Planted around 1689 and covering a third of an acre, this trapezoid maze contains half a mile of paths separated by thick hedges too tall to see over. The King's Guard Chamber offers a fascinating look at the arms and armor of Henry VIII's time. The collection includes more than 2,840 muskets and pistols, swords and daggers, as well as pieces of armor all arranged in decorative patterns on the room's walls. The newest addition to the attractions at Hampton Court is the Cumberland Art Gallery, displaying some of the finest works from the Royal Collection. Here, you'll see one of Rembrandt's self-portraits; a Grand Canal scene by Canaletto; and paintings by Holbein, van Dyck and Gainsborough. 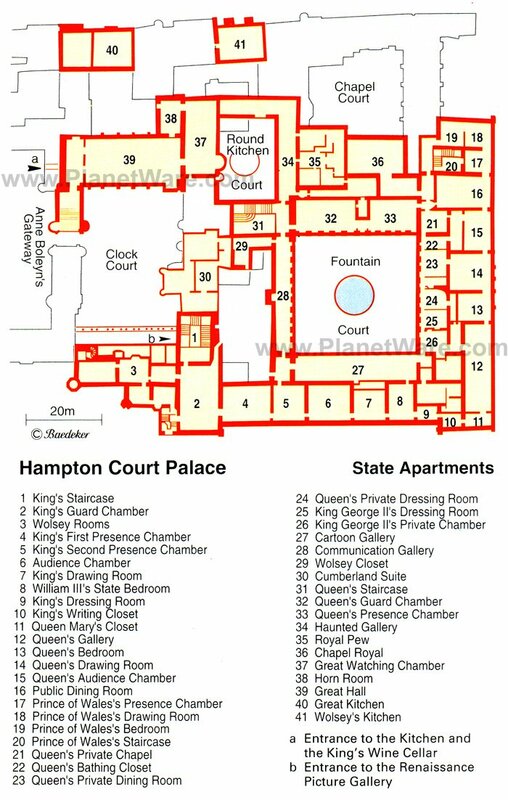 Entrance is included in Hampton Court Palace admission. Ever wondered what it would be like to sleep in a palace? You can, in the imposing 18th-century Georgian House, an elegant building at Hampton Court Palace that was built as the kitchens for George, Prince of Wales. On the alley leading to Henry VIII's tennis court, the Georgian House has been renovated as a self-catering home that sleeps 8 and has its own private walled garden. Not only will you have the unique opportunity to wander the grounds after the gates have shut for the day, but you can make yourself at home to explore the gardens, courtyards, and public rooms of the palace during opening hours as often as you like. You'll get to know the palace staff and become part of palace life yourself. For details and reservations, visit the Landmark Trust website. Two major events take place inside the grounds of Hampton Court each year. For two weeks in June, the Hampton Court Palace Festival draws some of the biggest names in pop and classical music for concerts in the stunning setting of the palace. It's one of the country's most popular outdoor music events. For tickets and details, visit the Hampton Court Palace Festival website. For a week in July, the already beautiful grounds are turned into a wonderland of colorful blooms with the week-long Hampton Court Palace Flower Show. Sponsored by the Royal Horticultural Society, this is the world's biggest annual flower show, filled with specially designed gardens, spectacular flower displays, and shopping for everything garden or flower-related. For dates and tickets, visit the Royal Horticultural Society website. Sports enthusiasts won't be disappointed by a trip to Hampton Court. The palace's long association with tennis began in 1528 after Henry VIII built the country's first tennis court. Although the palace's tennis club is private, introductory lessons are available. Golfers may find themselves sharing the greens with members of Hampton Court's large herd of deer, but they'll have the pleasure of playing on the only course in the country set in a Royal Park. Hampton Court Palace Golf Club is a 6,514-yard, par-71 course. Fishing is also popular on the grounds, in the waters of Hampton Court and Bushy Park, and annual permits are available from the ticket office. The Mitre Hotel: 4-star B&B, beautiful riverside terrace, elegant decor, large rooms. The Lion Gate Mews: mid-range pricing, steps from the palace and park, lovely apartments, fully equipped kitchens. Tours and Tickets: As it's one of England's most popular tourist attractions, you can expect lines, especially during holiday periods. You can bypass these with priority admission, with a Skip the Line: Hampton Court Palace Entrance Ticket. This one-day pass allows you to arrive even at the busiest times and walk straight inside to explore on your own or join one of the free tours by authentically costumed guides. On a three-hour Hampton Court Bike Tour, you can explore the palace grounds and adjoining Bushy Park with a lively and well-informed guide. On the leisurely eight-mile ride, you'll see and learn about President Eisenhower's WWII base; King Henry VIII's former hunting grounds; and the Long Water canal, modeled after Versailles gardens, with fine palace views. For Kids: Actors playing the roles of King Henry VIII and his courtiers bring to life historic events that took place here (pick up a schedule as you enter), and a Family Trails tour leads you on a self-guided palace walk designed for children. Tickets for admission to the Magic Garden (a fun park for kids) and the Maze can be purchased separately without full palace admission. For Your Comfort: Prepare for a lot of walking, especially if you plan to explore the magnificent gardens. A luggage facility off Clock Court contains lockers. Getting To Hampton Court Palace: Buses run regularly from Kingston, and trains run every half hour from London's Waterloo station. A riverboat service operates from Westminster, Richmond-upon-Thames, and Kingston-upon-Thames in the summer.